Home / Blog / Why Is My Calf Muscle Twitching? Why Is My Calf Muscle Twitching? Maybe watching your favorite show on TV or browsing the Internet, and suddenly you experience a spontaneous episode of calf muscle twitching. Or perhaps, like what happens with me on occasion, you’ve just finished an intensive round of exercise, CrossFit for example, and that exertion is followed with some calf muscle twitching. Has this ever happened to you? I know it well, and it can certainly be concerning. 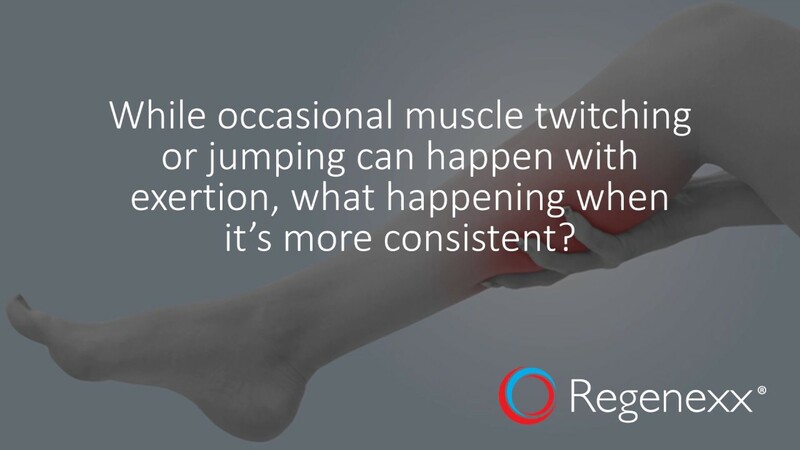 So what causes your calf muscle to twitch or jump, and should you be worried about it if it’s a consistent occurrence? Believe it or not, the answer can often be found in your low back. Let me explain by first reviewing the spinal nerves (and be sure to watch my brief video above). The spinal nerves transmit signals from your brain that tell your muscles to contract. So the spinal nerves are the middlemen that connect the brain to the rest of the body and vice versa. When those signals become disrupted for some reason, or there is irritation to the nerve, this can cause parts of your muscles to twitch (the medical term for “twitch” is fasciculate). I’ve blogged before about how the body is one big connected machine (the knee bone is connected to the ankle bone and so on), yet the medical industry has broken us down into component parts by treating the body by each section rather than as a whole. To effectively treat a patient, we need to treat the body as the whole unit that it is, and the spine is a good example of this. For one fascinating example, we can look all the way down to the foot—bunions. Bunions are more than just bunions, yet an orthopedic surgeon will “fix” them surgically by removing them. Bunions, however, can be caused by nerve irritation in your low back, so if the root cause isn’t also addressed, more problems are likely to follow. This is an example of only treating the sign (the bunion) of a much bigger problem (the spine issue that resulted in the bunion) and not considering the body as a whole. Likewise, calf muscle twitching can be the sign of a bigger problem: a problem in the low-back spinal nerves. The nerves that branch off of your spine in your low back connect to the muscles in the legs. Specifically, with the calf muscle, we are looking at nerves from about the L5 (fifth lumbar-level vertebra) to the S2 (second sacrum-level vertebra) as it’s the S1 and S2 nerves in the spine that usually supply the calf muscle. When there is a problem in this area, such as a pinched nerve or bulging disc, this irritates the nerve and can cause calf muscle twitching. So do you need to do anything about it? Yes, you should have your low back checked. The calf muscle twitching may be your first sign that there is a problem, and tracking it down as early as possible and addressing the problem if there is one will assure that no further damage is done. You might ask, but wouldn’t my back hurt if I had a pinched nerve or a problem with a disc? Maybe or maybe not. Your back may or may not be stiff or sore yet because, as I mentioned, the calf muscle twitching can be the first indication that something is wrong. This low back and calf muscle connection is so important that the damaged nerves in this area of the low back can lead to calf tears. This happened to me, and one of my warning signs leading up to my calf tear was twitching and jumping in my calf muscle. Incidentally, while I did have some mild low back pain once in a while, it was rare. The nerves are so imperative to our calf muscles (and this is true for any of our muscles throughout our body) that if the nerves stay damaged long term, this can even cause shrinkage and eventually atrophy of that calf muscle. The upshot? So what if you have your calf muscle twitching checked out and find that you do indeed have an irritated nerve in your low back? Then what? First, your irritated nerve can usually be helped with either physical therapy or the injection of fourth-generation platelet lysate, which is growth factors isolated from your own blood platelets. Next, be sure to pat yourself on the back because you’re ahead of the game, and treating it now could save you further damage down the road. I add twitching after I got off work when I was younger, it turned out to be CMT. Is there a point where a nerve stays damaged for long term that it can't be turned back on with a platelet lysate injection? I think PL works better when there is nerve irritation or scarring around a nerve, but not as well once nerve axons have died off. I have been going through this for a year, finally got an MRI to confirm the s1 nerve is irritated. It has been getting better slowly over months with physical therapy. Instead of my calf re-tightening in a day it now takes roughly a week. So I get on the slantboard religiously and keep biding my time. I was offered a right L5 TFE with corticosteroid for the nerve. Should I hold out for platelet lysate? How is one better than the other? Chris, how often in your practice does the platelet lysate work to stop the calf twitching specifically, I have seen the spine PL pain charts. But I really don't have pain so much as a twitching slowly tightening calf muscle. I had an EMG today and they said it wasn't anything "acute" however it was something that I would have to live with and maybe it would heal. Has there been cases where you healed this condition? Chad, it just depends on the cause of the S1 nerve root irritation. I have this very issue and when I get S1 epidurals with platelet lysate it goes away until I do something to irritate that nerve (for about a year at a time). However, I have some severe chronic low back issues. In a patient with lesser issues, it may be cured. So I got the flu, and ended up getting a steroid shot (in the glute) and it went away for a week or two. I have been doing a ton of PT and weight loss (-115lbs in a year) and it has helped but I can just tell one calf dorsiflexes better than the other. Basically (when it was bad) if I plantarflexed the right foot the calf "locks" and I have to force it back down. That has gotten better over time with the PT and dry needling and slant boards for days. How long after a steroid shot in the glute would you wait to get PL treatment? You'd need to wait 6 weeks between the steroid shot and a PL procedure. I believe I am currently experiencing this right now. I had spinal surgery just over a year ago. The past week or more has been hell in that my calves won't take a break. They always feel like they're constricting or "jumping" around. What is my next move? Unfortunately, spine surgery in any area of the spine is damage to accomplish a goal. Please see: https://www.regenexx.com/spine-surgery-damage-accomplish-goal/ We'd need to examine you to see what's going on in your particular case. Please call 888 684 9919 or submit the Candidate form if you'd like us to weigh in. I have had 3 back surgeries, last one in 2008. I still have chronic back pain. I just woke up with cramp in my calf and now both are twitching and jumping around. Quite strange to see really. If I don't have my feet flat on the ground and try to lay back down I'll start getting the cramps again in my calf. We'd need to examine you to answer that question. The areas most commonly associated with Calf twitching are S1 and S2 and could easily be affected by surgery above that level. Please see: https://www.regenexx.com/pain-after-back-fusion-adjacent-segment-disease/ and https://www.regenexx.com/back-fusion-outcome-fusion-leads-to-dead-multifidus/ https://www.regenexx.com/multifidus-back-pain/ These are issues not commonly focused on by Orthopedic surgeons, except for suggesting additional surgery, but may be worth a try. For assistance in setting up an exam with a Regenexx Doctor, or to see if you would be a Candidate, please call 855 622 7838. This was such a great article to find. I have a spontaneous spinal CSF leak and hEDS. Shortly after all of my CSF leak symptoms started I was having constant calf muscle tightening and twitching and ended up tearing my gastroc muscle with just a small movement. This connects the dots for me, which is great. I recently had an epidural blood patch to try and treat the leak and during the procedure my calves were both twitching like crazy. Unfortunately, the first patch was unsuccessful, but really interesting to make this connection. Chris, I'm hoping this is my problem. My calf began twitching about 3 weeks ago, and at least once or twice a week there is also some mild tingling happening in my shin and sometimes hamstring on same leg. I of course went to google and have convinced myself I have ALS even without other symptoms. It's literally just this calf twitch that is terrifying me. There is also some twitching that occasionally happens in my eyelid and some other random parts of my body, but the left calf is more or less regular and persistent. No pain, so I didn't think it was sciatica. We'd need to examine you to see what's going on in your situation. The most likely thing would be an S1 issue in low back, despite no back pain, which we can treat. Please see: https://www.regenexx.com/conditions-treated/spine/ If you'd like to do that, please either submit the Candidate form here: www.regenexx.com, or give us a call at 755 622 7838. Hi Chris - I had a massive charley horse in my knee about a month and a half ago. Since then, I've had muscle twitches in my calf as well as behind my knee. Took a d-dimer and no clot. Also went to an Ortho specialist but they really didn't give me anything conclusive as to what's going on. Not really a lot of pain, just random spasming/twitching and mild discomfort at times. Would love to hear your opinion on the matter. Thank you! Other than spinal nerves, "Charlie horses" and other leg cramps can be caused by things like circulatory problems most importantly a blood clot, dehydration, side effects of medication, a magnesium or potassium deficiency, among others. This explains the likely suspects for pain behind the knee: https://www.regenexx.com/blog/back-of-knee-pain-whats-wong/ But if this continues, we'll need to take a look.